For the community in Northampton County, see Chesapeake, Northampton County, Virginia. In 1963, the new independent city of Chesapeake was created when the former independent city of South Norfolk consolidated with Norfolk County. The consolidation, authorized by the Virginia General Assembly, was approved and the new name selected by the voters of each communities by referendum. 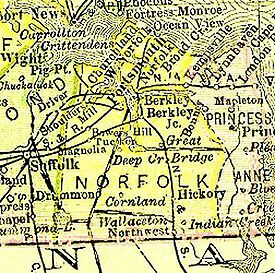 Formed in 1691 in the Virginia Colony, Norfolk County had originally included essentially all the area which became the towns and later cities of Norfolk, Portsmouth, and South Norfolk, but had seen its area frequently reduced as these cities added territory through annexations after 1871. Becoming an independent city was a method for the former county to stabilize borders with neighbors, as cities could not annex territory from each other. Chesapeake is not in Northhampton V.A. The Chesapeake region has roots extending back to Virginia's colonial past. Along Chesapeake's segment of the Intracoastal Waterway, where the Great Bridge locks mark the transition between the Southern Branch of the Elizabeth River and the Chesapeake and Albemarle Canal, lies the site of the Battle of Great Bridge. Fought on December 9, 1775, in the early days of the American Revolutionary War, the battle resulted in the removal of Lord Dunmore and all vestiges of English Government from the Colony and Dominion of Virginia. Until the late 1980s and early 1990s, much of Chesapeake was either suburban or rural, serving as a bedroom community of the adjacent cities of Norfolk and Virginia Beach with residents commuting to these locations. Beginning in the late 1980s and accelerating in the 1990s, however, Chesapeake saw significant growth, attracting numerous and significant industries and businesses of its own. This explosive growth quickly led to strains on the municipal infrastructure, ranging from intrusion of saltwater into the city's water supply to congested roads and schools. Chesapeake made national headlines in 2003 when, under a court-ordered change of venue, the community hosted the first trial of convicted murderer Beltway sniper Lee Boyd Malvo for one of the 2002 terrorist-style attacks. A jury spared him a potential death sentence, choosing a sentence of "life in prison without parole" instead for the young man, who was 17 years old at the time of the crime spree. A jury in neighboring Virginia Beach sentenced his older partner John Allen Muhammad to death for another of the attacks. Chesapeake is located at 36°46′2″N 76°17′14″W﻿ / ﻿36.76722, -76.28722 (36.767398, -76.287405). As of the census of 2010, there were 222,209 people, 69,900 households, and 54,172 families residing in the city. The population density was 584.6 people per square mile (225.7/km²). There were 72,672 housing units at an average density of 213.3 per square mile (82.4/km²). The racial makeup of the city was 62.6% White, 29.8% Black or African American, 0.4% Native American, 2.9% Asian, 0.1% Pacific Islander, 1.2% from other races, and 3.0% from two or more races. 4.4% of the population were Hispanics or Latinos of any race. There were 69,900 households out of which 41.0% had children under the age of 18 living with them, 59.7% were married couples living together, 14.0% had a female householder with no husband present, and 22.5% were non-families. 18.0% of all households were made up of individuals and 5.9% had someone living alone who was 65 years of age or older. The average household size was 2.79 and the average family size was 3.17. The age distribution was: 28.8% under the age of 18, 8.2% from 18 to 24, 32.3% from 25 to 44, 21.7% from 45 to 64, and 9.0% who were 65 years of age or older. The median age was 35 years. For every 100 females there were 94.4 males. For every 100 females age 18 and over, there were 91.0 males. The median income for a household in the city was $50,743, and the median income for a family was $56,302. Males had a median income of $39,204 versus $26,391 for females. The per capita income for the city was $20,949. About 6.1% of families and 7.3% of the population were below the poverty line, including 9.7% of those under age 18 and 9.0% of those age 65 or over. Chesapeake is formally divided politically into six boroughs: South Norfolk, Pleasant Grove, Butts Road, Washington, Deep Creek and Western Branch. Chesapeake's daily newspaper is the Virginian-Pilot. Other papers include the Port Folio Weekly, the New Journal and Guide, and the Hampton Roads Business Journal. Hampton Roads Magazine serves as a bi-monthly regional magazine for Chesapeake and the Hampton Roads area. Chesapeake is served by a variety of radio stations on the AM and FM dials, with towers located around the Hampton Roads area. Chesapeake is also served by several television stations. The Hampton Roads designated market area (DMA) is the 42nd largest in the U.S. with 712,790 homes (0.64% of the total U.S.). The major network television affiliates are WTKR-TV 3 (CBS), WAVY 10 (NBC), WVEC-TV 13 (ABC), WGNT 27 (CW), WTVZ 33 (MyNetworkTV), WVBT 43 (Fox), and WPXV 49 (ION Television). The Public Broadcasting Service station is WHRO-TV 15. Chesapeake residents also can receive independent stations, such as WSKY broadcasting on channel 4 from the Outer Banks of North Carolina and WGBS broadcasting on channel 7 from Hampton. Chesapeake is served by Cox Communications which provides LNC 5, a local 24-hour cable news television network. DirecTV and Dish Network are also popular as an alternative to cable television in Chesapeake. Chesapeake and Albemarle Railroad is a shortline railroad in Chesapeake. The growth of Chesapeake and its predecessors has been fueled by its location and transportation considerations. These continue to be major factors. The Intracoastal Waterway passes through Chesapeake. Chesapeake also has extensive frontage and port facilities on the navigable portions of the Western and Southern branches of the Elizabeth River. The Dismal Swamp Canal runs through Chesapeake as well. The site of this canal was surveyed by George Washington, among others, and is known as "Washington's Ditch." It is the oldest continuously used man made canal in the United States today and has been in service for over 230 years. The canal begins in the Deep Creek section of the city branching off from the Southern Branch of the Elizabeth River. 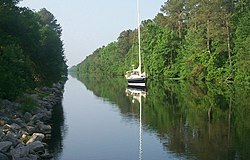 The canal runs through Chesapeake paralleling U.S. Highway 17 into North Carolina and connects to Elizabeth City, North Carolina. Chesapeake is located on a potential line for high speed passenger rail service between Richmond and South Hampton Roads which is being studied by the Virginia Department of Rail and Public Transportation. A new suburban passenger station near Bowers Hill would potentially be included to supplement a terminal in downtown Norfolk. Chesapeake is the only locality in the Hampton Roads area with a separate bridge division. The city's Department of Public Works, Bridges and Structures division has 51 full-time workers. The city maintains 90 bridges and overpasses. Included are five movable span (draw) bridges which open an estimated 30,000 times a year for water vessels. See also Transportation section of article Hampton Roads. Water and sewer services are provided by the City's Department of Utilities. Chesapeake receives its electricity from Dominion Virginia Power which has local sources including the Chesapeake Energy Center (a coal-fired and gas power plant), coal-fired plants in the City and Southampton County, and the Surry Nuclear Power Plant. Norfolk headquartered Virginia Natural Gas, a subsidiary of AGL Resources, distributes natural gas to the City from storage plants in James City County and in the City. The Virginia tidewater area has grown faster than the local freshwater supply. Chesapeake receives the majority of its water from the Northwest River in the southeastern part of the city. To deal with intermittent high salt content, Chesapeake implemented an advanced reverse osmosis system at its Northwest River water treatment plant in the late 1990s. The river water has always been salty, and the fresh groundwater is no longer available in most areas. Currently, additional freshwater for the South Hampton Roads area is pumped from Lake Gaston, about 80 miles (130 km) west, which straddles the Virginia-North Carolina border along with the Blackwater and Nottaway rivers. The pipeline is 76 miles (122 km) long and 60 inches (1,500 mm) in diameter. Much of its follows the former right-of-way of an abandoned portion of the Virginian Railway. It is capable of pumping 60 million gallons of water per day(60MGD). The cities of Norfolk and Virginia Beach are partners in the project. Chesapeake, Virginia is the hometown of 4 x World Kickboxing Champion Bubba Blackhawk Walters who also attended Deep Creek High School. It is also the off-season residence of New York Mets' third baseman David Wright, and the hometown of the Washington Redskins' Pro Bowl cornerback DeAngelo Hall and Philadelphia Eagles defensive end Darryl Tapp. Like Walters, both Hall and Tapp graduated from Deep Creek High School. NASCAR driver Ricky Rudd was also raised there and went to Indian River High school, where former NBA superstar Alonzo Mourning also attended. Chris Richardson, a finalist on American Idol: Season 6 also resides in Chesapeake. Chesapeake, Virginia is also the hometown for the following baseball players: BJ Upton, center fielder for the Tampa Bay Rays; his brother Justin Upton, right fielder for the Arizona Diamondbacks; Michael Cuddyer of the Minnesota Twins; Scott Sizemore, second baseman for the Detroit Tigers; and Michael E. Mitchell, outfielder for the Asheville Tourists/Minor League "A" Team of the Colorado Rockies. BJ Upton graduated from Greenbrier Christian Academy. David Wright and Scott Sizemore are graduates of Hickory High School. Justin Upton, Michael Mitchell, and Michael Cuddyer are graduates of Great Bridge High School. Controversial anti-abortion activist Donald Spitz currently lives in Chesapeake. ^ "Hampton Roads News Links". abyznewslinks.com. http://www.abyznewslinks.com/unitevavb.htm. Retrieved 2007-08-06. ^ "Hampton Roads Magazine". Hampton Roads Magazine. http://www.hrmag.com. Retrieved 2007-08-06. ^ "Hampton Roads Radio Links". ontheradio.net. http://www.ontheradio.net/metro/Norfolk_VA.aspx. Retrieved 2007-08-06. ^ "Hampton Roads Sanitation District". Hampton Roads Sanitation District. http://www.hrsd.state.va.us/. Retrieved 2008-03-08. Live streaming audio of Chesapeake Police Dept & Fire Dept. This page uses content from the English language Wikipedia. The original content was at Chesapeake, Virginia. The list of authors can be seen in the page history. As with this Familypedia wiki, the content of Wikipedia is available under the Creative Commons License.